Ive had a Zen 8Mb circuit for nine or so years, and never been able to get more than 2mb. They always blamed BT (line provider) so Ive moved the line to them as of 3rd Jan. When I called and said I was getting line issues (installed a copy of net uptime monitor) the support guy said he could ping my router and that was good enough. 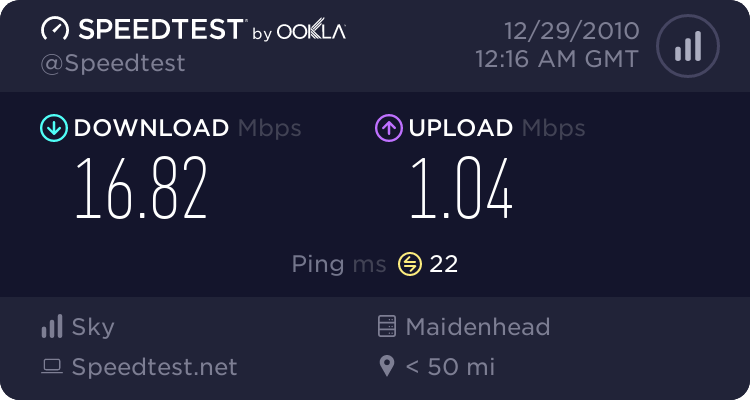 Any suggestions (apart from change ISP) please ? you need to get hold of line stats from your router/modem. you have a very high base latency which is suggesting your line has issues and interleaving (and probably also high snr margin) is been used to hide it. I am off the belief thats not a fix but a workaround which has the penalty of reduced performance, the problem is if it is a line fault of some sort, you will have a hard time getting it fixed because that costs the line provider money. Whilst DLM does not. Also whats important from the router stats is the line attenuation as we dont even know what the line is capable off outside of fault conditions. he can get his dlm profile reset or maybe goto LLU as you said, but if it turns out DLM did the right thing ie. the line was very unstable without the changes then ultimately he will end up again on similiar settings. When I was on ukonline eg. before SRA was available I still had issues, it was SRA that saved me on there, the lack of DLM just guaruntueed my line would stay on the settings I wanted and I could fiddle with the router as much as I wanted without throttling my line. What I would consider reasonable is if a line ever gets put on such agreesive DLM settings a fault ticket should be auto raised as clearly a line that needs 15db and interleaving has something wrong with it. I also think that there is a line fault. My house is less than half a kilometer from the local cabinet, but at the end of my road there is a junction box with a 100pair cable that has been underwater for some time (BT Engineer says). #1 Zen DSL 8MB Office (this is the one we are discussing). I have now transferred the line completely to Zen away from BT as neither party would be responsible for faults and each one blamed the other. #2 was BT Broadband, but has been 'upgraded' to an Infinity 2. The enginee says he can get 40Mb at the cabinet, but that drops to 20Mb at my router/hub. I also have problems and since going to Infinity 2 the line has been down more than it has been up (was down for first 3 weeks). Now it claims a 16Mb down, but times-out when trying to play simple you tube video clips. The last of the Openreach engineers told me about the faulty line connection at the end of the road, and says he knows it will be completely repaired by a specalist cabling repair team very shortly. In the meantime, Zen happly take my cash for a full 8Mb line and BT happly take my cash for a rubbish Infinity 2. I work from home and need resilience, sadtly that has been lacking from all parties. IMHO BT/Openreach etc have failed to maintain the infastructure as they can legitimately say the voice works OK.
My reason for posting this was after a particularly 'smug' Zen call agent said he could ping my router so that was fair enough and all was well, the usual - "you need to call your line provider" was mentioned, and when I said that from the 3rd Jan it would be Zen he went quiet. Thanks for a great product (BQM). You appear to be ignoring the simple words UP TO, which for DSL based services are very important. The line stats from the ADSL modem will help people judge whether there looks to be a line fault. How many meters are you from the fibre cabinet for the VDSL2 line? VDSL speeds drop off very rapidly with distance, so it may not be that there is any problem just a case of expectations and sales staff not fully explaining the reality of life to you. Your right of course Andrew, but at less than 500m from the cab, you would have expected the line test from BT that says you can expect 25Mb on a 40Mb circuit to be a bit closer. Before installing the BQM and Internet Uptime Monitor I just put up with the rubbish service, but after my work colleages in Singapore say that he has to put up with a rubbish old 100Mb circuit it does make you wonder. be aware zen dont own the line as such, openreach own the line and zen resell it to you. But of course now you deal with zen for voice and broadband faults so in theory it simplifies things. My limited travels of Europe has revealed some great mobile and broadband coverage, and some that is a lot worse than lots of the UK. Can you please PM your details so I can take a look at the line for you. ZeN are recruiting! Click here to view the opportunities available.